If you are a youth boat we want to help you, financially, to get to events outside of Ireland. To apply just download and fill in the form below electronically and email it to Colman. You can also post it to him. All details are provided in the form. One application of €100 per boat only. Both helm and crew in the boat must be youths (Under 22 on the 1st of January 2018). Payment will be made once you have attended the event. Have you any old GP14 Fittings or Equipment? Hugh and SDC's aim is to try and get more adult sailors into the sport and specifically into GP14s. Do you have any GP 14 fittings or equipment which you no longer need/use and would consider donating to the SDC GP14 restoration project? Time to renew your GP14 membership. Fees remain the same as last year. Do you recognize a few of these youthful sailors...? Thanks to Bob Torrens for sending it on. The Jack Austin Fund provides grants for junior boats where both helm and crew are under 22 years. The grant can be used to help with travel costs. Grant applications need to be submitted before 1st March 2018. World entry form with deposit by 1st April. Thanks to all of the committee members and sailing clubs for sorting out the 2018 venues and dates. The committee also secured full sponsorship for the 2018 calendar. Special thanks to Andy Johnston for organising the calendar set up and photographs. Congratulations to GP14's Alastair Duffin who received an RYA Exceptional Service Award for his positive impact to the sport of sailing. He was presented with the award by double Gold medallist Shirley Robertson OBE and Dan Moon representing sponsors Greers of Antrim. The RYANI ceremony was held at Malone House, Belfast on Friday 24 November 2017. Alastair is a Boat builder in East Belfast, following his joinery apprenticeship he joined his father’s building firm and followed his father into building boats on the side. In his peak years he build many different boats including Cadets, Mirrors, Herons, Scorpions, Enterprises and Wayfarers to name but some, with his busiest year account for 25 boats, something he admits he would not like to do again. Changing fashions have seen sailors moving from wooden to fiberglass boats, but Alastair would argue that, each wooden boat is unique, with its own character, allowing you to put your own stamp on it making it special. It’s well known that Alastair’s boats are special, having won many GP14 world Championships and his GP14s are revered across the UK and the world. Alistair’s sailing ability has seen him at the front of the GP fleet for many years, learning first what would make the boat competitive. He has worked with the GP14 Association and been instrumental in the ongoing development of the boat. Working in wood he had the ability experiment and introduces new design features within the class rules, making it the attractive fast high performance boat it is today. A testament to the quiet nature of Alastair could be seen in the protection he received from the nesting Blackbird in the eaves of his building which challenged those who came to visit him. Another factoid that Duffin Marine followers will know is that Alastair also built a working replica of Harry Fergusons 1909 Monoplane for a BBC Documentary! The Hot Toddy saw the biggest turn out for the 2017 GP14 calendar with 31 boats in Mullingar. OOD Fred Ternan, with agreement from sailors, sailed 4 races on Saturday giving only 2 to sail on Sunday in case Hurricane Ophelia made land earlier than expected. Both days were medium winds with some gusts coming and going over the lough making for great close tactics and some great racing. The GP14 Annual Hot Toddy event took place over the weekend of the 14th / 15th October 2017 on beautiful Lough Owel hosted by Mullingar Sailing Club. Racing began on Saturday on flat water and with the wind shifting in force and direction, some large gains were made and lost up wind. At the end of Saturday’s four races Shane MacCarthy & Damian Bracken had two race wins and Curly Morris & Laura McFarland and John & Donal McGuinness one race win apiece. With Keith Louden & Alan Thompson putting together some very consistent results, this meant that any one of four boats could potentially win the event going into the final day. Race five began on Sunday morning with individual recalls. The McGuinnesses and Louden/Thompson teams decided to return and start correctly and together with the aid of some large shifts both teams moved through the fleet to finish 2nd and 3rd respectively. Morris & McFarland took the win after MacCarthy & Bracken were judged to have been on course side at the start. Going into the final race the points were now much tighter. MacCarthy & Bracken still leading, McGuinnesses in second on break of tie with Louden & Thompson and Morris & McFarland in fourth place. second and third place, a battle which the McGuinnesses eventually won. Thanks once again to Mullingar sailing club for kindly welcoming the GP14 fleet to Lough Owel and for their hospitality during the weekend. Registration: Saturday 14th Oct. 2017 from 9.30am to 11am. Brian Walker, Garadice, Kilcock, Co. Meath. "Fresh from winning bronze at the U23 Finn World Championships earlier this summer, Baltimore’s Fionn Lyden has won the All Ireland Sailing Championships at Mullingar Sailing Club today. The series was decided on a knife-edge finale that saw Lyden match-race to the finishing-line with GP14 World Champion Shane McCarthy from Greystones who was denied victory by the tie-break in the series." 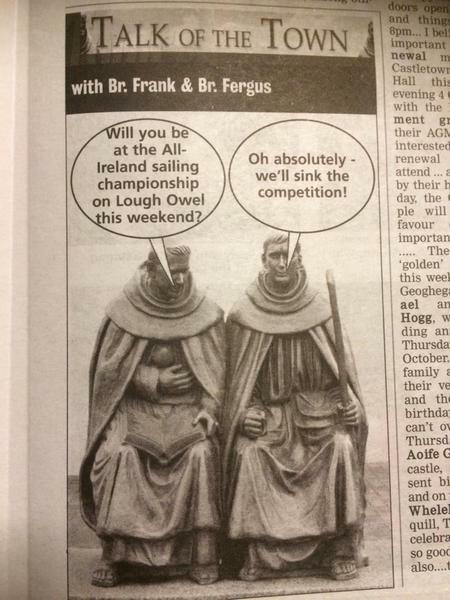 Good luck to the sailors & Mullingar! 9 of our GP14 Ireland boats are being lent out for the All Ireland Sailing Championship hosted by Mullingar Sailing Club. The club are getting good press for the event - see pics below. 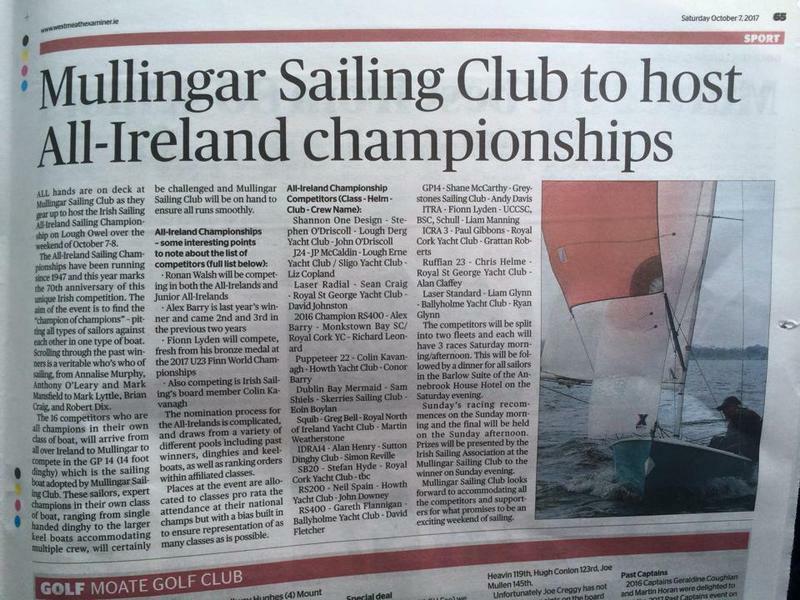 “All hands are on deck at Mullingar Sailing Club as we gear up to host the Irish Sailing All Ireland Sailing Championship on Lough Owel over the weekend of 7-8 October. The All Ireland Sailing Championships have been running since 1947 and this year marks the 70th anniversary of this unique Irish competition. The aim of the event is to find the “champion of champions” – pitting all types of sailors against each other in one type of boat. Scrolling through the past winners is a veritable who’s who of sailing, from Annalise Murphy, Anthony O’Leary and Mark Mansfield to Mark Lyttle, Brian Craig, and Robert Dix. The 16 competitors who are all champions in their own class of boat, will arrive from all over Ireland to Mullingar to compete in the GP 14 (14 foot dinghy) which is the sailing boat adopted by Mullingar Sailing Club. 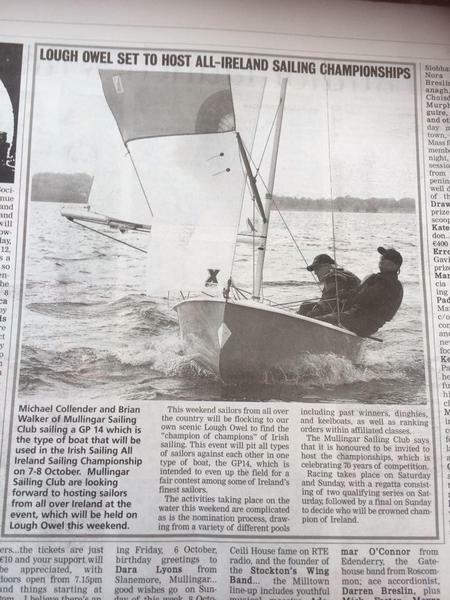 These sailors, expert champions in their own class of boat, ranging from single handed dinghy to the larger keel boats accommodating multiple crew, will certainly be challenged and Mullingar Sailing Club will be on hand to ensure all runs smoothly. A superb GP14 racing weekend was held at Royal Cork YC in Crosshaven. Saturday started breezy but eased off to medium winds but was a cold day on the water. Sunday the sun shone all day to give a great day’s sailing with good breeze around. Windward leewards were sailed for all races. Upwind and downwind proved to be very tactical. The Youth championship was hotly contested and the training that Colman & Blessington organized the weekend before shone through. Congratulations to Jack Buttimer on sweeping the Youths to take U21, U19 & U16 titles. Congratulations to Ger Owens who got to take the top podium place in both the Autumn Open, as helm with Damien Bracken, and the Youth Championships, as crew for Jack. A big thanks to all of the GP14 owners lending their boats out to the Irish youth. Full results and reports to follow. 10 brave sailors ascended on to the picturesque lakes at Blessington Sailing Club last weekend for some vigorous training and a bit of fun! The poor weather did little to dampen the mood and crews from Youghal, Blessington, Greystones and Rush did not delay in getting their boats rigged and on the water. We had a nice breeze for the day and with a yellow weather warning due to spoil our Sunday it was decided to maximise the time on the water on Saturday with two long sessions. Thanks to Simon Cully, Richard Street and Colman Grimes for giving the young guns plenty of training drills and it was great to see significant progress as the day went on. Despite there being plenty of breeze at times, we did not have any capsizes (other than one man overboard footstrap snap capsize drill!). A huge improvement for this same group of sailors on last year’s training. Tired bodies had just enough energy left in the evening to munch on a great feast thanks to the wonderful Jenny & Richard Street and Simon Cully flipping the Burgers while still blowing his whistle. Delicious! Sunday arrived with more rain and more wind, but nothing that this young bunch couldn’t handle. The very talented Alan Blay arrived to offer his expertise. After a short briefing it was decided to get on the water as soon as possible with the wind forecast to strengthen further. The wind blew hard and Alan put the gang through varies drills, between the odd capsize. The gusts were strong and with energy levels slipping it was decided to head in for some hot showers, soup and some theory to wrap up the weekend. Good fun was had by all and it was decided that Blessington SC should be on the annual training calendar given its safe waters, quick access to the sailing area, camping and most of all the warm and friendly welcome of its members. Thanks to the participants for showing up and giving it their all and being greats sports, to Richard and Simon for organising everything, Ellis, Lily, Libby and James on Rescue, Paul and Pat on Shorewatch and Jenny and Val for the lovely food all weekend. On behalf of all the youths thanks to EXE Sails and the Howard Davies Memorial Fund for the continued support. Best of luck to those heading to the Youths in Cork this weekend where we will be expecting close on 20 boats for this hotly contested event. One of Newtownards SC’s top crew & soon to be top helm, Josh Porter ends an era with his move to his new job with Winder Boats in England. Wishing Josh the best of luck with the new job. equivalent to €250 is on offer to the overall winner of the event. Below taken from Michelle Evans' article in Y&Y. "With ten months to go until the 2018 Gul World Championship in Mount's Bay there are already as many people signed up as there were at the Nationals a month ago with 64 boats confirmed. This will be the fifth time the class has been to Mount's Bay and with so much early interest it looks set to be the biggest event for at least a decade as a veritable who's who of amateur dinghy sailing are already entered. A multiple winner in other classes, Nick Craig has yet to crack the GP14s and will be back for another go in 2018. As will the current GP14 World Champion helm Shane MacCarthy and Solo National Champion Andy Davis, the current multiple National Champions Ian Dobson and Andy Tunnicliffe, former National Champion Mike Senior with Chris White, not to mention OK World Champion Jim Hunt, sailing with Liz Senior. Also looking for a place in the top five will be the current Fireball National Champion Matt Burge and former Laser 2000 national champion Fergus Barnham, with Andy Hunter...."
The “24 Hour Race” is the UK’s No.1 dinghy endurance race, and the GP14 class is the largest that takes part in this race, and has been running as an annual event for 50 years! The race is sailed in classic dinghies (Enterprise, GP14, Lark and Firefly) on the relatively safe waters of the Marine Lake at Southport, and racing is continuous for 24 Hours, even in extreme weather conditions. For full results see GP14 Leagues page. Blessington SC have offered to host the rescheduled GP14 Youth Training this September. It will be a great practice weekend for the upcoming GP14 Youth Championship in Crosshaven the following weekend. Places are limited and we already have 7 boats booked up so if you are interested get in touch as soon as possible. If you don't have a boat or just want to get involved helming or crewing please get in touch as we should be able to pair you up with someone else. There is a nominal charge of just €10 per person. Blessington know how to put on a good show and this will hopefully be a memorable event for our ever growing youth fleet. Plenty of camping is available and there is a BBQ planned for Saturday night. The 2017 Irish Nationals were held on 19th-21st August at Ballyholme Yacht Club. 29 boats competed which included one visiting team from the UK – John Hayes, an ex 470 campaigner from Southport who was sailing with Joel James. Overall numbers were down a bit on previous years due to a number of mitigating factors. However those unable to attend missed a superb event with a wide range of conditions, superb race management, excellent hospitality and exceptionally close racing. Chief measurer Jimmy McKee was in attendance on Friday night & Saturday morning to scrutineer and weigh boats. The forecast for Saturday was borderline and the fleet were held ashore initially for an hour or so to allow the wind to subside. When the fleet did eventually take to the water, the lull in conditions proved to be only temporary. Shortly after the start of race one, the committee boat began recording gusts of 30 knots. The ensuing white knuckle race saw Shane MacCarthy & Damian Bracken winning from Sligo’s Niall Henry & Ossian Geraghty with Sutton sailors Alan Blay & David Johnston 3rd. With only 15 boats finishing and conditions refusing to abate, the race committee made the sensible decision to send the fleet home after a single race. Once ashore competitors enjoyed a superb bar-b-que where the famous Ballyholme rib-eye steaks lived up to all of the pre-event hype. In the end however, Ger & Mel held their nerve and won the last race and with it, the overall event. Doire Shiels & Andrew Sexton won the Silver fleet finishing in 10th overall while Sutton’s Shane MacLoughlin & Rory Murdoch won the bronze fleet. Top youths were Gareth & Richard Gallagher in 12th position overall. Thanks to our OOD Robin Gray and his team for exceptional race management, David Fletcher for all his hard work in organising the event and everyone at Ballyholme Yacht Club who contributed to such an enjoyable championship.